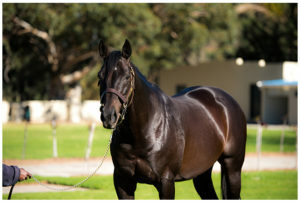 Ridgemont Highlands’ father and son sires Dynasty and Jackson were responsible for a pair of winners on Saturday and Sunday respectively, with Dynasty progeny winning the last two races at Turffontein on Saturday, and Jackson tasting success in two different countries the following day. The Highlands bred Jackson enjoyed success in both South Africa and Zimbabwe on Sunday, with his 3yo son Jack Of Hearts catching the eye at Scottsville on Sunday. Trained by Garth Puller, the Ascot Stud bred gelding stormed home to shed his maiden by 1.25 lengths over 1950m, under Ridgemont retained rider Anton Marcus. Jack Of Hearts, who has now won or placed in three of his four starts, had been runner up at his two previous outings. The gelding was Jackson’s only runner at Scottsville on Sunday, and the triple G1 winning Jackson enjoyed another 100% winners to runners strike rate at Borrowdale, when his gelded son Action Jackson landed a novice stakes over 1600m in emphatic style. Now a winner of two of only four outings, Action Jackson had been second in the Guineas Trial at his previous start. He was bred by Ian Longmore, who raced Jackson to six wins including victories in all of the G1 Investec Cape Derby, G1 Daily News 2000 and G1 Champions Cup. Jackson, whose notable first crop performers also include G1 filly Can You Feel It and the smart performers Heaven’s Embrace and Water Spirit, has six yearlings on offer at the 2019 Cape Yearling Sale.